The main narrative of Episode One was the trio finally getting their hands on the “Holy Trinity” of hypercars: The La Ferrari, McLaren P1 and Porsche 918. That’s exactly what they had been trying to do on Top Gear before Jeremy Clarkson ruined everything over a cold-cut. Because they made that clear in Series 22 of Top Gear, and because we all knew that, making the “Trinity” the focus of the introductory episode to what was supposed to be something new just ended up feeling like the late arrival of a broken promise. It met expectations, but did not exceed them as I’m sure many of us had hoped. The opening to the show was a fun and overblown sequence dramatizing Clarkson leaving the BBC and finding a new “home” with Amazon in Los Angeles, ultimately leading to a “Burning Van” gathering of enthusiasts in the desert with our trio arriving with Clarkson in a Galpin Fisker Ford Mustang and Hammond and May in tow. The rest of the show plateaued into heavily-structured quibbling and overly-edited racetrack sequences. Essentially, right where we last left off. Of course I missed the Clarkson-era Top Gear. The failure of Chris Evans and a slew of new hosts has put the future of what once was an international media giant in serious question. Ever since, all anyone has wanted was to see these three familiar old dudes drive cars, make ridiculous analogies and argue with one another. On that front, The Grand Tour delivers. It absolutely does. At least on its first episode, however, The Grand Tour doesn’t deliver anything new. There was a lot of discussion about just how little the new show could pull from old Top Gear segments like the Star In A Reasonably Priced Car, The Stig and the studio. 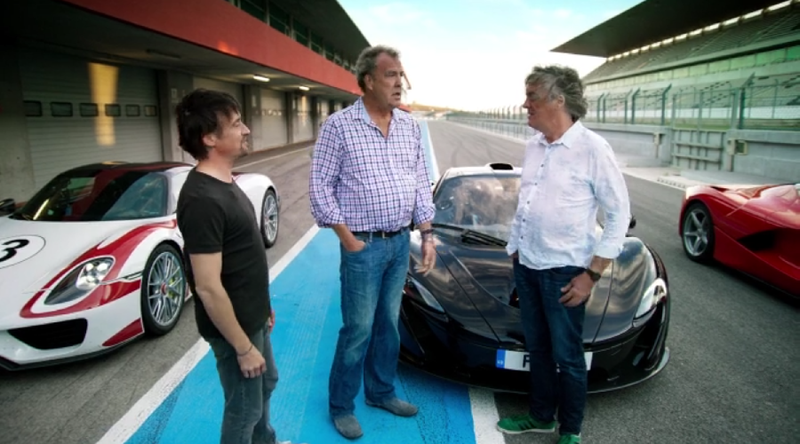 Where the rebooted Top Gear attempted to add to each of the segments to a fault, The Grand Tour stumbles over its attempts to mock them. Instead of Star In A Reasonably Priced Car, the new show introduces Celebrity Brain Crash, which they openly joke is a knock-off of that old thing they used to do. The mockery is that they kill off their three celebrity guests before they get a chance to work through the new segment. Sure, it delivers a cheap gag and I don’t mind it, but I genuinely hope this is a sign that The Grand Tour is actually killing off any attempt to be derivative of Top Gear’s definitively worst segment. Then there was the part with the American driver named Mike Skinner who labels anything without a V8 a product of “communism.” Again, this is a mockery of The Stig setting Top Gear lap times—and Clarkson’s general disdain for the U.S.—but the crew introduces a leaderboard, suggesting that this will be a returning segment with a fat American re-skin, and not anything genuinely refreshing or new. To be quite honest, bringing on former-Stig Ben Collins as some sort of badass character for this segment would be far more appealing than the cheap comedy we’re getting. And then of course we have the “touring” aspect of The Grand Tour, which is the world-roaming tent that replaces the Top Gear studio. It’s just Top Gear’s “The News” segment stretched across the entire show’s narrative now, except without any real news. I’m least concerned about them sticking to this show layout however, as it was invented with the Clarkson-era Top Gear and I can’t imagine a better way to package Clarkson, Hammond and May’s presenting style. They are the Studio, the Studio is them. But in a show where everything else is a little too familiar and not very refreshing, it’s canned in a manner that is a little too familiar and not very refreshing. Ultimately I’m happy with The Grand Tour. Of course I am. It’s the three people that got me into cars in the first place doing exactly what I fell in love with them over. But I expected something newer and fresher, and I got Hey-It’s-Not-Top-Gear-LOL. The best part of the show remains its opening. I expected The Grand Tour to essentially be a season-long globe-trotting adventure with our three hosts, similar to the old Top Gear specials. I suspect there will be episodes in the future that follow that expectation, along with silly build challenges and other familiar narratives the new show can’t shake off from Top Gear, but the show isn’t going to be anything as fresh as I think many of us expected. I’d love to see more firm, cinematic narratives like the opening to this first episode. We all know Clarkson, Hammond and May like to follow a script no matter how good they are at acting unstructured, so why not create a more traditional comedy narrative for them to follow? Make it a new segment! It was new and fresh, and emotional and fun! They are on a completely new format, let’s see them make genuine films starring the characters of Clarkson, Hammond and May, perhaps as an opening to new episodes. It would be a great contrast to the “real” build challenges and international adventures. Whatever the future of The Grand Tour holds, I’m on board. I just wish I could be a little more excited about what to expect, and a little less fearful that I’m going to get alternate-reality Top Gear.